The image immediately below shows a RILSIM data form with a quarter of the form obscured along the right side and at the bottom. Compare with the second image, which correctly displays the entire form. RILSIM 1.05 may exhibit the incorrect display behavior when the user's computer has been set to display Large Fonts (120 dpi resolution) rather than the default Small Fonts (96 dpi resolution). 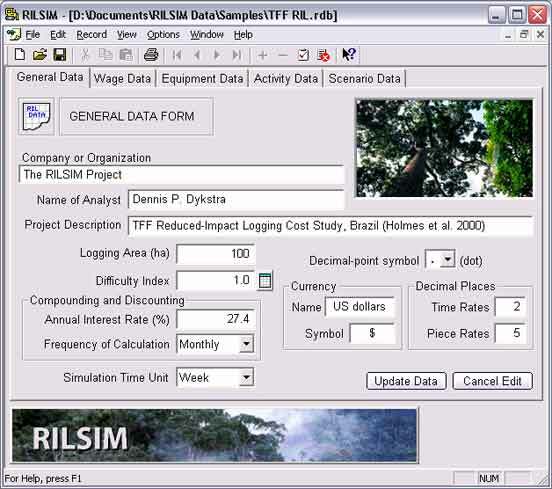 The hidden portion of the form cannot be made visible by enlarging the RILSIM window, changing the size of the embedded data form window, or any other action available to users. Among other things, this can prevent users from accessing data fields and buttons that have been placed along the right side or the bottom of the form. The display problem can be solved in RILSIM 1.05 by setting the display adapter to use Small Fonts, which causes the main RILSIM window to be displayed at its full width and depth. However, the Large Fonts setting is preferable for many people, so this is not a satisfactory solution. To correct the problem in a more fundamental way, the programming error was fixed in version 1.06 of RILSIM. The fixed version was released in August 2003, only a few days after the problem was first reported by a user. All subsequent versions of RILSIM use a programming approach that avoids the problem.